Socialising while you're on a diet that excludes all grains, refined sugars, dairy, nuts, seeds, nightshades, lots of everyday spices and eggs? Sounds tricky, right? No alcohol. No pizza. No fries. No popcorn at the movies, and DEFINITELY no chocolate chip fudge brownie ice cream. But with a bit of practice, you can come up with AIP-compliant meals so you eat what you're supposed to - and your non-AIP or paleo guests will actually LIKE it, too. 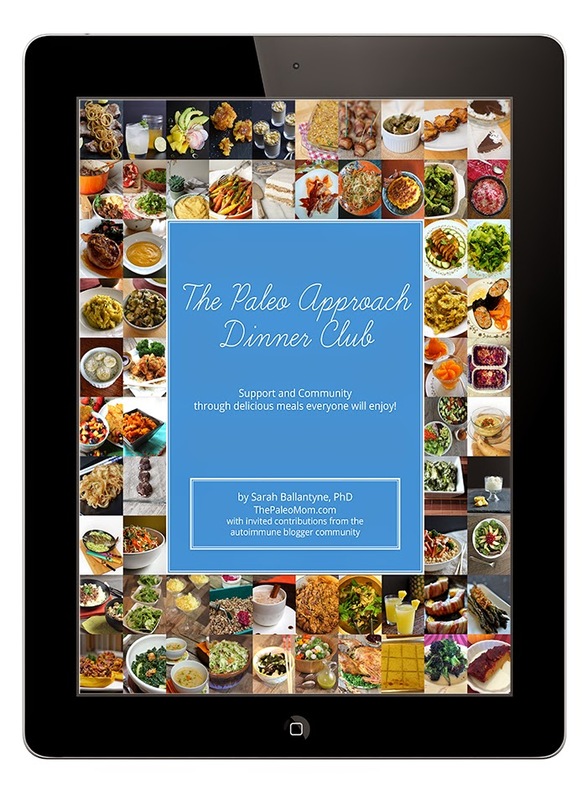 And Sarah Ballantyne, The Paleo Mom has made this all even easier for you with her new e-book. The idea of the dinner club is based around a group of people taking it in turns to meet up at each other's houses, and bringing a dish to eat. It's a great idea for those with special dietary requirements because then you know there'll be something there that you can enjoy. And eating a restrictive diet for health reasons can be, well, quite lonely. So it's a lovely way of getting like-minded people together, too. I know I'd love to meet up with all my AIP blogging friends, mostly for the fun and banter, but also because I'd hope that Mickey Trescott would bring her AIP coconut and raspberry cheesecake along. Aherm. So anyway. That's how it all works. Sarah's e-book contains 82 recipes - some are hers, while others are created by other AIP food bloggers - that are all suitable for serving at a dinner party, or a special meal. It's laid out in 12-week meal plans, with a key so that everyone gets assigned a letter of the alphabet and then knows exactly which foods they're bringing for the whole 12-week period, to each dinner. There's Honey Balsamic Slow-Cooker Short Ribs, Bacon-Mashed Yams and Instant Raspberry Soft-Serve in week 4, for example. There are Asian-style foods, warm comforting foods and then really surprising and indulgent dishes, like the gorgeous Sea-salted Caramel Bon Bons (I have my eye on you, week 7). There's also a paleo section on how to cook for a kids' table - so they don't get left out (this part is straight paleo, rather than AIP). There are suggestions on everything from laying the table to party games you can play. And a brief outline of the autoimmune protocol that recaps on which foods to avoid and why. I realise I've been very favourable about the book so far. I'm trying to think of something to say to balance it out a bit - a bit of constructive criticism. But I can't. The photography and design are great, the information is thorough, and you have 82 recipes from Sarah and a host of other AIP bloggers, too, all for $16.99. Dinner parties and special occasions on the autoimmune protocol are now sorted. Another great AIP resource. I'll be cooking up some of the recipes in the e-book over the coming weeks, stay tuned for photos on my Instagram, Facebook and Twitter. Want to find out more, or download your copy? Click here to visit ThePaleoMom now.